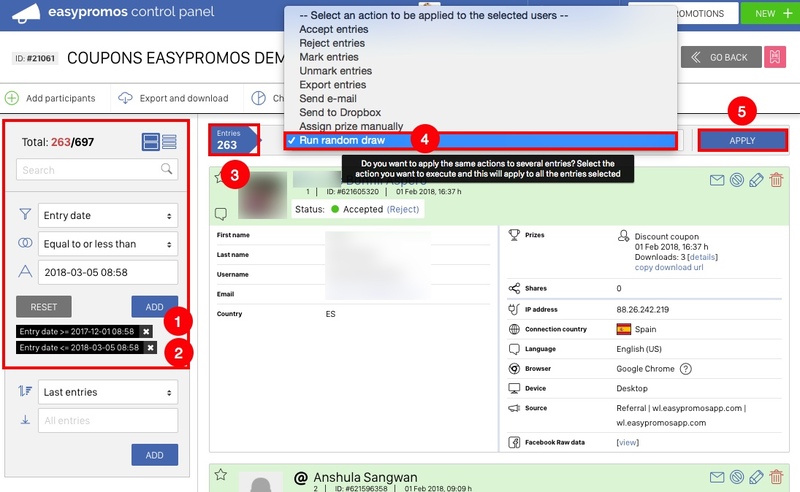 When users register for a promotion they are added in real time to the Participants List. You can consult this list at any time from the “Participants” section. In this article we’ll show how you can implement some of the most popular filters in order to run a random draw among specific segments of the Participants List. Note: "rejected" participants are never included in the random draw. Run a random draw among participants who signed up during a particular time period. Run a random draw among the 20 most-voted finalists. Run a random draw among the 20 finalists who recruited the most participants. 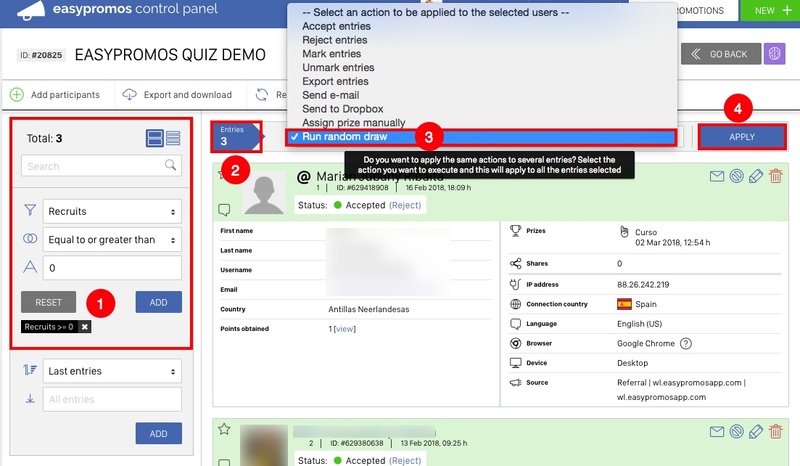 Run a random draw based on a specific answer to a survey question. Run a random draw among Twitter and Instagram participants, excluding those who participated via the Entry Form. Run a random draw among 10 specific participants. Run a random draw among participants who correctly answered all the questions to a quiz. Run a random draw or send an email to a specific group of participants. 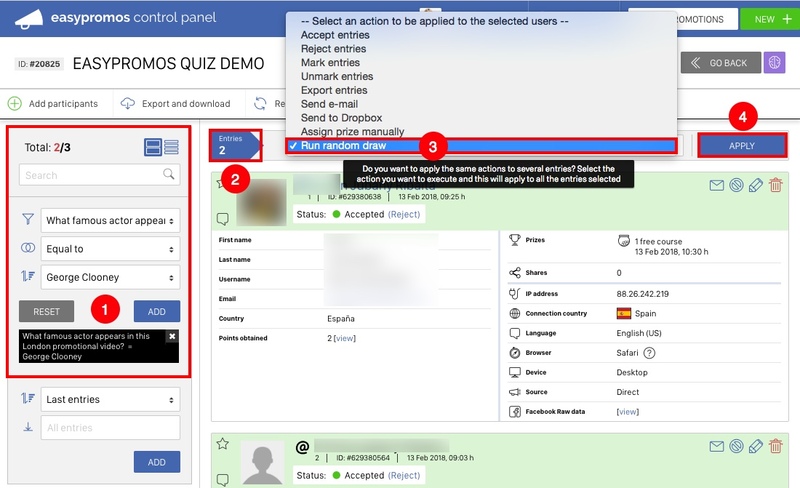 Run a random draw or send an email to a specific group of participants belonging to two or more segments. Run a random draw among the participants who have obtained a minimum number of recruits. 1. Use the “Entry Date” filter to indicate the start date of the period you wish to select. For example, in this example we have selected Entry Date > Equal or greater than> 01/12/2017. Add this filter. 2. Create another filter using the same tool. This filter will be added to the first one. Enter the end date: the day on which you want to stop including participants. For example, Entry Date > Equal or less than > 05/03/2018. Add this filter. The two filters will exclude any participants who did not register for the promotion between these two dates. 3. Check that the number of segmented participants is less than the total number registered, and that these participants registered during the defined week-long period. 4. Select “Run random draw” to start the selection of winners. Only those who feature on the segmented list – participants who registered for the promotion during the dates defined – will be included in the sweepstakes. 1. Filter participants by votes using the setting Votes > Equal to or greater than > 0. Add the filter. If you’d like to exclude finalists who don’t obtain a single vote, or who obtain less than a certain number of votes, you can change the variable to ensure they’re not selected. For example: Votes > Equal or greater than > 5 (only participants with 5 votes or more will be selected). 2. Sort by “Most voted” and indicate that you wish to include "20" participants. This will sort participants from the previous filter on the basis of the number of votes obtained – from most to least. Use the second field to limit the number of participants you wish to display in the segmented list. 3. Click "Add" to add this second filter. 4. These are your segmented finalists. 5. Apply the action you need. In this case, click on "Run random draw" to start the selection of winners and alternates from your list of finalists. 1. To filter participants by the number of participants recruited, use the setting Recruited > Equal to or greater than > 0. Add the filter. If you’d like to exclude those who were unable to recruit any participants at all, or those who recruited less than a certain number, change the variable accordingly. For example, Recruited > Equal to or greater than > 5 (only participants who have obtained 5 recruits or more will be selected). 2. Sort participants by "Most users recruited" and indicate that you’d like to end up with "20" users. Participants from the previous filter will then be sorted by number of recruits obtained, from most to least. With the second field you can limit the number of participants that you’d like to display in the segmented list. 3. Click the “Add” button to apply the second filter. 5. Apply the action you need. In this case, click on "Run random draw" to start selecting winners and alternates from your finalists. 1. Filter participants on the basis of a particular response to a survey question. Use the second field to define your answer with the “Equal to” option. In the third field choose the response that interests you. Add the filter. 2. Only participants who answered this question in the way you’ve defined will now be displayed in the list. 3. Run a random draw to select winners and alternates from the segmented participants. In this case you’d select "1|2" to include Twitter and Instagram participants only. 2. Check that participants from these two social networks have been selected. 3. Choose which action to take with this segmentation. In this case, choose "Run random draw". 1. Use the Search Tool to find the 10 finalists you want to include in the sweepstakes. 2. Mark with the star icon each entry you want to include in the sweepstakes. 5. 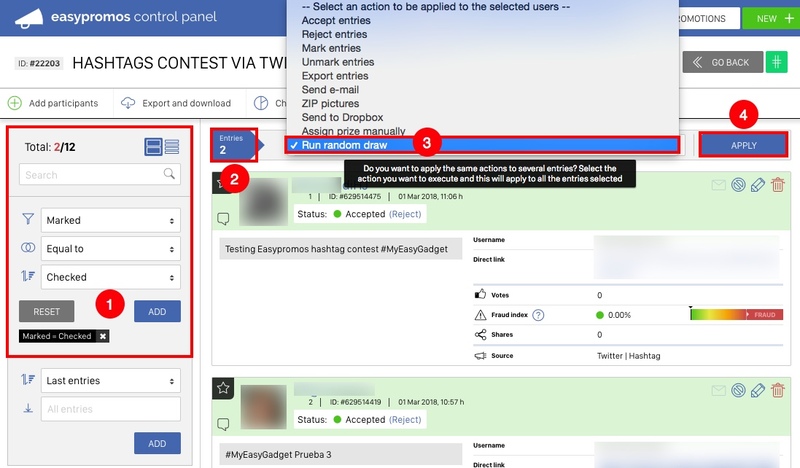 Once you have marked all the users you want to include in the sweepstakes, apply the filter Marked > Equal to > Checked. 6. Finally, choose which action to take with this segmentation. In this case, choose "Run random draw". 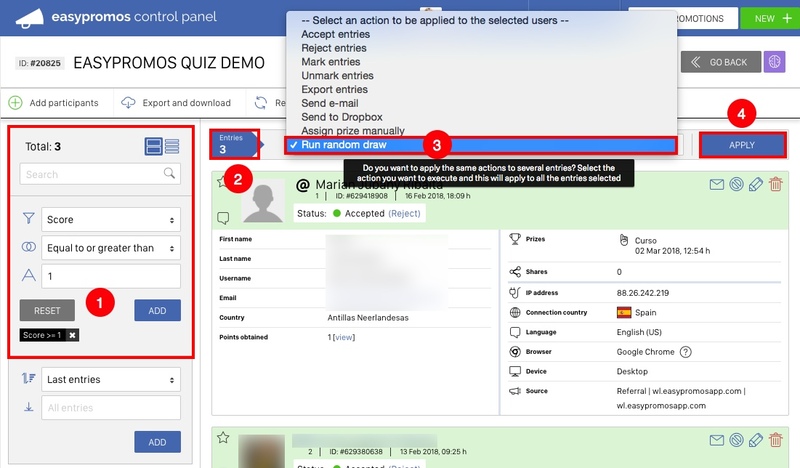 Before you apply the filter, confirm the maximum number of points available to a participant who correctly answered all the questions to a quiz. 1. Segment the finalists by using the following filter: Score > Equal to > Maximum possible number of points a participant could attain. Add the filter. 2. Only participants who attained the full complement of points will be your finalists. 3. Choose the action "Run random draw" to begin the random selection of winners from among your finalists. 1. 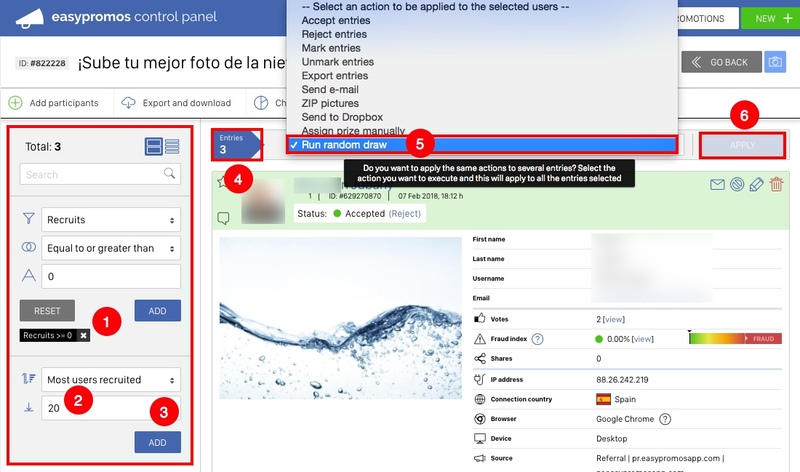 Use the star icon on the entry left-corner to select manually each entry. Mark all the entries you want to include in the segment. 2. Create a segment with the filter Marked > Equal to > Checked. 3. Choose the bulk action you need from the list of actions. 4. Confirm with the "Apply" button. 1. Create the first segment with the appropriate filter. 2. Use the bulk action "Mark entries". 3. Confirm with the "Apply" button. All the entries of this segment will be marked with the star icon. 4. 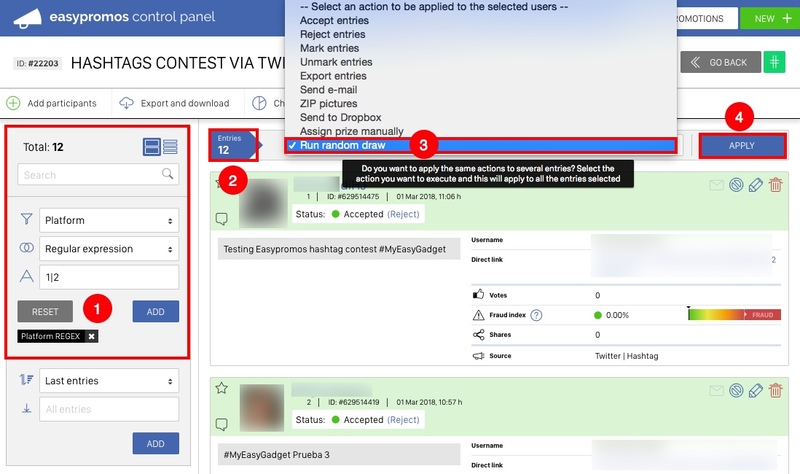 Create a second filter and mark the participants of this segment with the same bulk action, "Mark entries". Repeat the action until you have all the participants of all the segments marked. 5. Filter the list of entries with Marked > Equal to > Checked and you will obtain the advanced segment. Use it in any of the bulk action options. 1. Filter the participants by recruited with the Recruits> Equal or greater> setting to 1 (or the minimum number that you have defined in your contest). Add this filter. 2. 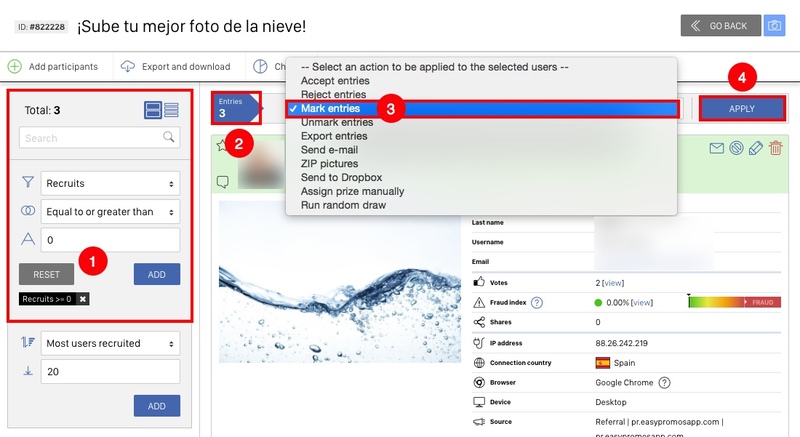 Then, in the list of bulk actions, select the action "Run a random draw". 3. 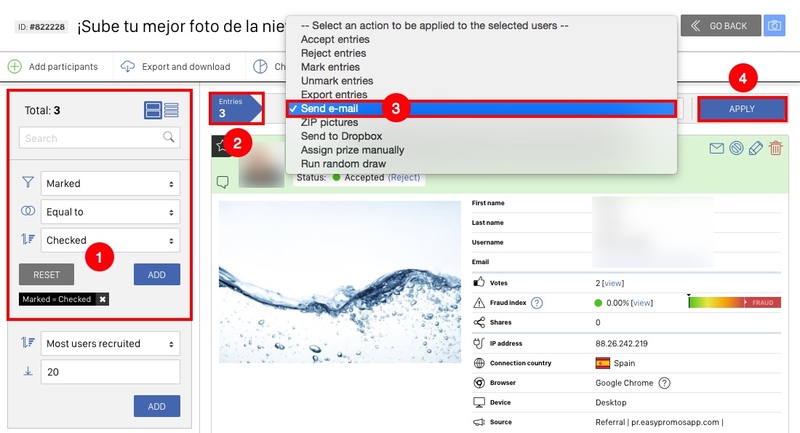 Finally, click on the "Apply" button, and you will access the "Winners" tool, where you can start the selection of winners, being the finalists only those segmented participants that appear in the list: the participants with the minimum number of recruits indicated.